Butterfly wings: Saturday wash out. Today is a wash out , it's cold and raining so I am resting and maybe watch some TV this afternoon while stitching . There's lots of sport today that's if you like sport , I must say I love most sports . I have spent most of the week sorting upstairs and getting rid of loads of junk where does it all come from ? So I can sit with an inner peace that my work for this week is done until Monday. I will start today's post with a little stitch I stitched for our friend Ann who needed a hug , and I could not reach Scotland so I sent her a little something to brighten her day. 28 ct white sparkle evenweave and dmc threads , and the material you see is the backing. I was feeling a little under the weather this past week and yesterday I received a lovely HAPPY package of our sweet friend Lynda who is a stitching sister of mine . My Sis brought me the four season charts well that cheered me up no end I love new stash so I have already started to get the threads together for the first chart of Spring. Thank you so much my dear stitching Sis . Valentines day this week so I thought I would show you some of my past stitching . Happy Valentines day friends for this week. 2015 ! where did those years go . Just a quick run into the garden this week. Have a great week and thank you once again for your lovely comments . Well what do you know the sun is trying to come out ! What a lovely, perfect gift for dear Ann. Wow! Those are wonderful gifts from Lynda Ruth! I am shocked at your garden June!! Your garden looks amazing ....such wonderful signs of spring! Lovely valentine's day stitching. What a sweet pansy! And such a pretty collection of Valentine stitching, I just love the friendship tree, so cute! The violet looks wonderful. A lovely gift for your friend. So many beautiful little Valentine's ornaments. I love them. June you are the sweetest, your stitching and finishing is beautiful. Love the photos from your garden. Your garden flowers are looking so pretty June, it reminds us all that Spring is just around the corner. It's a good feeling to get things tidied up. Thank you again for the lovely gift - a special something to keep. Such a lovely post, amazing flowers in your garden already. The pink camellia is beautiful. Love all your Valentines stitcheries. They will look so pretty in an arrangement on your shelf.Loved the crosstitch charts you received they will be lovely to do . Hope you have a good week.Our heatwave broke thank goodness few days ago, it was pretty bad heat wise. Now we are having rain, with warm temperatures which gives humidity++. It is jolly hard not to complain about it. I am ready to ship out and experience a bit of snow I think.Hugs to you June. that's a really nice little motive, I really like the pansy. And the season charts look interesting. And you have already embroidered such magical Valentine's motifs - wonderful to look at. This little pansy is very beautiful and so are all the flowers in your garden. It's very kind of you to share these beautiful colours with us especially on rainy days like today. Lovely creations for Valentine's Day. I think we have had 4 seasons in one day here today. A wonderful gift for Ann, I am sure it brightened her day. Lovely charts from Lynda. Beautiful Valentines stitching, I can see you will have a lovely display. 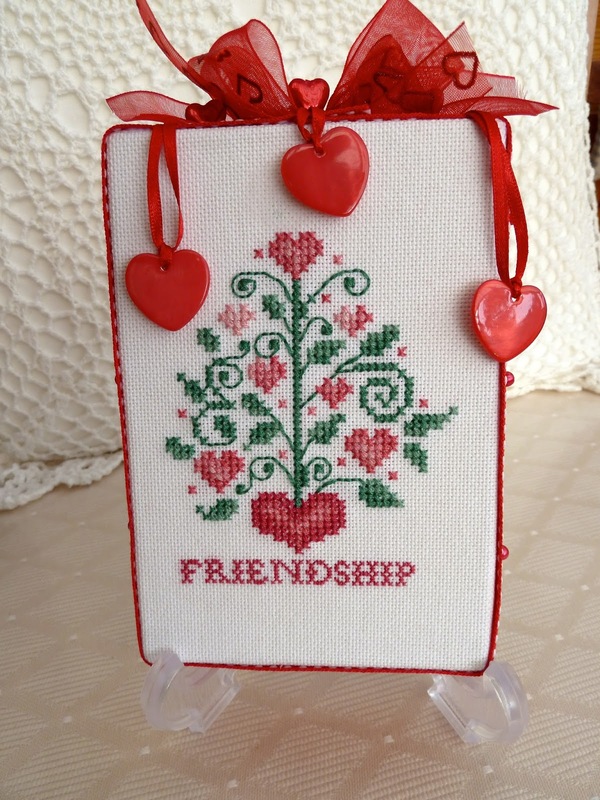 Your collection of Valentine stitching is beautiful June,as is your gift to your friend.Hope you are well again. A very special gift for Ann, what a lovely gesture. Love the new header picture. Sweet valentine finishes you have shared June. Fabulous new seasons charts, we are doing a seasons SAL at NH again this year, I have this years charts picked out but really like yours, might have to have a spending spree. Gorgeous Valentine's Day stitching June, I bet your dresser looks fabulous! What a sweet gift for Ann, I'm sure that cheered her up as much as your new charts did for you. I love your pansy from CS collection and too much the flowers of your garden. June: What a lovely gift for your Friend in Scotland, it is beautiful. All the Valentines from the past are lovely, you have a telent for finishing. Beautiful photos of the garden. Great stash you have Lynda is sweet to send them to you. Thank-you for the Valentine Rose. What a lovely collection of Valentines. You should have joined our Hop last week! Nice set of charts from Lynda, I do like a seasonal series.